While the present Greek crisis continues, I have decided each morning to suggest Tiny, Tickable, Achievable Targets as ways of expressing support for Greece and Greeks in the present crisis. Then on Friday morning [10 July 2015] I suggested picking a Greek football team to support as a gesture of solidarity. These gestures may not change the agenda in Brussels, but you can make yourself and your family and friends feel more positive about Greece, and show solidarity in a humane way. 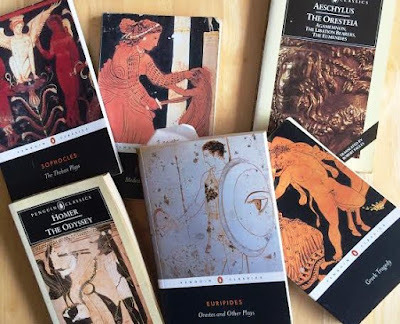 This morning, as a weekend pleasure, I am suggesting returning to the classics and reading or re-reading some of the great foundational works of European civilisation. But returning to the Classics is not about personal profit or promotion. It is about returning to the very roots of European civilisation, which some politicians and bankers in northern European seem to have forgotten. Classical Greece gave us democracy, theatre, drama, tragedy, the foundations of our poetry and literature, the chorus and the muses. The Greeks gave us the wisdom, philosophy and logic of Plato, Aristotle and Socrates. They gave use Euclidean and Pythagorean mathematics, Hippocratic medicine, and the principles of architecture. And they gave us the Olympic games and the gymnasium. Twenty years ago, in Greek as a Treat: An Introduction to the Classics (BBC/Penguin, 1995), Peter France rediscovered the people who for centuries were regarded as knowing best how to live. In art, science, medicine, politics, philosophy, sport, drama and history, the Greeks invented new ideas and set standards of beauty and excellence that have influenced and inspired the world and that in many cases have never been surpassed. It seems, however, that some of bankers and politicians in northern Europe today know only how to exercise autocracy or plutocracy or are aware only of their own concepts of Spartan lifestyles that they seem to want to impose on the people of Greece today.